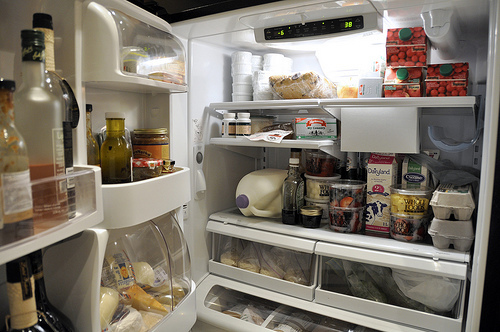 Have you ever come home and opened the fridge and said, “There’s nothing to eat” when in fact there is? Sometimes we take for granted a stocked fridge after all this is America a place with an obesity problem. Hunger only exists in faraway places like Africa or rural villages in Mexico. Now you can hear stomachs grumbling in more exotic places like Illinois. Hunger has always been here. I can’t say that my stomach ever grumbled but I’m sure my mom’s did as she tried to make ends meet. It made me aware of the dangers of living paycheck-to-paycheck. Growing up in the 80’s our fridge always had a huge olla de frijoles, tortillas and Holsum white bread for sandwiches. We ate this a lot and I couldn’t understand why didn’t buy more food. My mom would save up and once a year we’d order a pizza from Connies. It was a big deal for us and our neighbors would stop what they were doing and stare at the deliveryman and the piping hot pizza box. We could almost hear their stomachs grumbling. My parents didn’t know about food pantries and even if they did they would’ve been too proud to go and ask for help. Today, as the economy spirals many people don’t have the luxury of food and the increased demand is having an impact on the food banks themselves. Some food banks across the country have even been turning folks away. While there are a lot of campaigns on hunger and the holidays it’s a growing year round problem. The other day I was in the Dominick’s grocery store and they have prepackaged bags of nonperishable food at the front of the store. All you have to do is take one of these bags to the cashier, pay for it and place it in the food collection bin and they take it to a local pantry. I thought it was a good quick process. If you or someone you know needs food or would like to donate food see the resource links below. Remember panza llena corazón contento. Take Action Today! Need Food? Use the food pantry locator! Learn more about what’s being done to fight hunger across the nation. If you have food pantry suggestions or thoughts share them with us in the comment section. The more resources we can share with our community the more we can improve the quality of life for all of us.